This marks the second-straight episode of anime, after OverLord – 04, in which a group or groups are ultra-confident to the point of arrogance they have the upper hand over a foe, when in fact, they’re hanging by their pinkie off the edge of a cliff. The one to show them reality in OverLord was Momonga; here’s it’s everyone’s favorite human observer / information broker, Orihara Izaya. The confident parties include Heaven’s Gate, a group we were introduced to when Akabayashi broke up a drug racket in a club bathroom, and Amphisbaena, a rival group running underground casinos using cashless IC chips. Awakusu asks Izaya in investigate the latter, who knows he’s investigating them, and Heaven’t Slave knows too and wants to find a way to make it to their advantage. 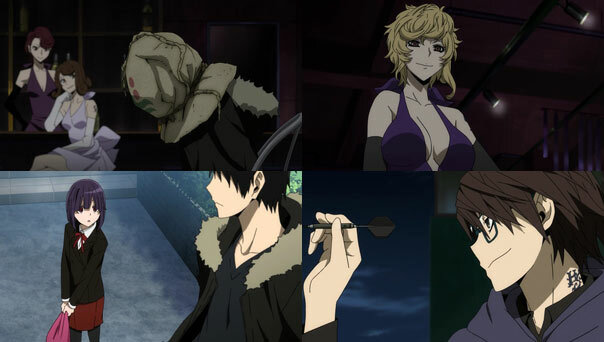 Izaya by now has assembled his team of muscle made up of Zombie Dragons, martial-arts ace Sharaku Mikage, a girl who is a Saika vessel, and a due with a big hammer, and more. 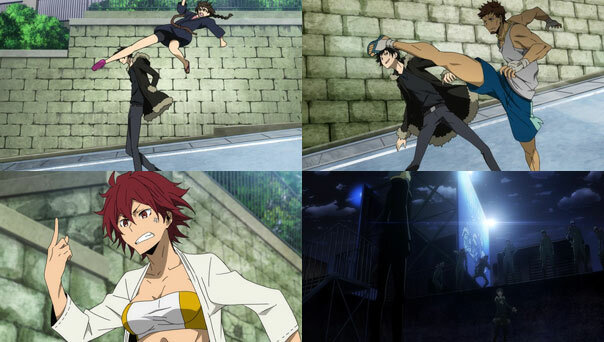 Yet, throughout the episode we cut from him interacting with both his team members, sisters, and Celty (to transport a laptop displaying GPS tracking data), to a man in his clothes with a burlap bag over his head being very lightly tortured by a very comely, well-dressed Amphisbaena member. Heaven’s Slave crashes Amphisbaena’s party, which gets both groups in the same place, and then it’s time to unmask the captive. 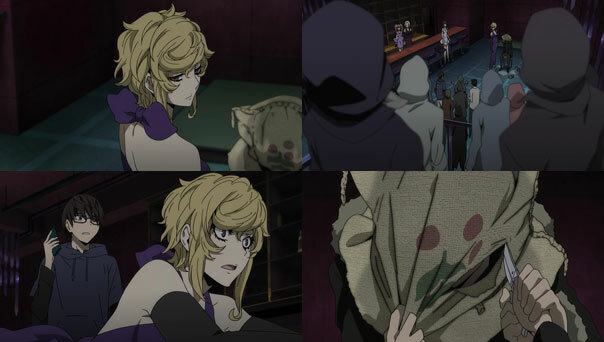 Both leaders get phone calls from someone with a disguised voice who momentarily gets them to believe they may have accidentally captured one of their own bosses, only for the captive to take his bag off and reveal it was Izaya all along, utterly unimpressed with Amphisbaena’s interrogation techniques. Then Izaya’s friends storm the place and lay absolute waste. Again, like in OverLord, there’s no contest between those who thought they had everything figured out and those who actually do. Heaven’s Slave and Amphisbaena are humiliated, and their inexperience with how things are done in Ikebukuro—with supernatural beings and elite specialists in various fields—and end up looking amateurish. The lesson is: don’t mess with Awakusu…or at least don’t mess with them when Izaya is working for/with them. 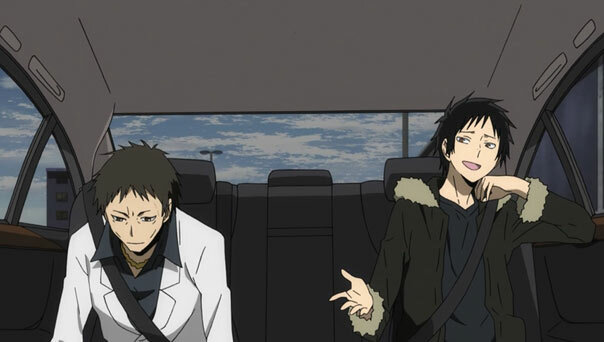 From Izaya’s victory we cut to another conversation with Shiki in the back seat of his car. Shiki is pleased both the rival gangs were dealt with, but warns Izaya they know he went above and beyond, and not to overstep his bounds with his new over-leveled mini-gang, and to call Akabayashi as soon as it’s convenient. Izaya acts the submissive part, as someone who receives “bliss” for being “used to the max” by Awakusu Group as an information broker. It’s not necessarily a dishonest statement, as his work does allow him to observe very interesting humans doing very interesting things. But I can’t believe he assembled that team just for that one job. There’s much more to observe and do. Thought I would just mention that the girl with Saika is Haruna from season 1 of Drrr (Izaya even says her name). She’s the one who went on the Saika ramapage in season 1 until Anri stopped her. Thank you. It’s been many years… I must confess I forgot about her!